The course Radio Interferometry: Methods and Science is organized by the German ARC node and offers a hands-on overview of major aspects of radio/mm/submm interferometry for master students, PhD students and senior astronomers. The lectures start with a general introduction to radio interferometry and data reduction, followed by an overview of various fields of research and the special observing modes that they require, given by experts of the respective fields. The latest developments of selected world-leading radio/mm/submm interferometers will be presented as well. The course also comprises a hands-on tutorial, where participants learn how to reduce interferometric data with the Common Astronomy Software Applications (CASA) package. The German ARC node offers remote access to the lectures and tutorials on a best-efforts basis (maximum 5 remote locations). If you would like to follow the course from a remote location, please contact us before 01 April at arc[at]astro.uni-bonn.de. 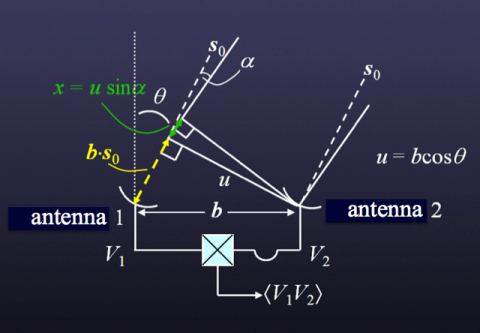 An ideal 1-D two-element interferometer, consisting of two antenna seperated by distance b.